The Stream Sounds Extension is an Extension that allows the players to Stream , Load and Play audio files from the Internet . 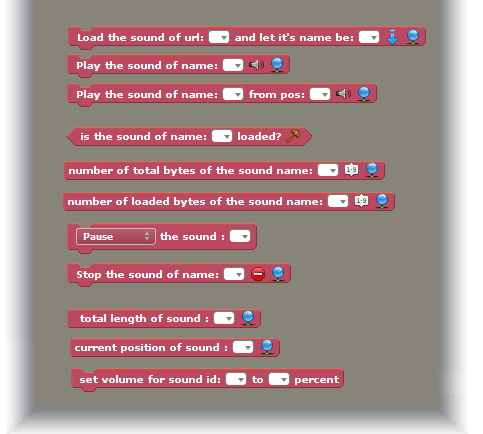 => Block to check whether sound has loaded or not. All SETTER blocks in this extension are to be happen only once, so consider them to use in events such as "WHEN CREATED"
Begins Loading of sound file, also asigns this file a name given by you. Plays the sound of name previously assigned by you. Plays the sound of name previously assigned by you and plays it from a desired position ( give input in Milliseconds ). Sets the volume of the sound file of name previously assigned by you to desired percentage. Stops playing the sound file of name previously assigned by you.